Although diet and exercise are widely known as the keys to weight loss success, there is another, lesser known contributor to losing – or gaining – weight. If you find yourself not getting enough sleep on a regular basis, or you wake up feeling unrested after a full night’s sleep, it could be contributing to weight gain. When your body is not well-rested, it’s less able to use calories efficiently, which is why you feel sluggish as you go about your day. Compound that with the fact that you take in more calories when you are tired. The American Journal of Clinical Nutrition reported that sleep-deprived study volunteers ate more during the night and were more likely to choose carbohydrate-heavy foods than volunteers who got enough rest. Those late night cravings probably resulted from an increase in the hormones that tell the brain to eat more. Women may be particularly susceptible to the connection between lack of rest and weight gain. One study found that women who reported less sleep over a 16-year period showed significantly more weight gain than their well-rested peers. Prioritize sleep time. Give yourself plenty of time for rest, preferably eight hours. Even if you aren’t sleeping that entire time, you’ve set yourself up for sleep success. Start a nightly routine. Doing the same things each night before you hit the hay can help prepare your mind and body for rest. Dim the lights, put on calming music, do a few stretches, read for a few minutes or do any relaxing activity that you can repeat each night. Turn off the TV. The bright lights of the television in your bedroom could be keeping you from sleeping, even if the programming isn’t. The body starts to produce the hormone Serotonin when there is a lack of light, so take the TV out of your late night routine. Stop eating, drinking, and exercising a couple of hours before bedtime. Waking up during the night to use the bathroom or because of late night eating indigestion can make it hard to get back to sleep. Be aware of how alcohol affects your sleep too. Even exercise, as helpful as it is for your sleep earlier in the day, can make it difficult to fall asleep if you work out too close to bedtime. Keep things comfortable. Could your bed or bedding be making it harder to fall asleep or stay asleep? Is your bedroom the right temperature? 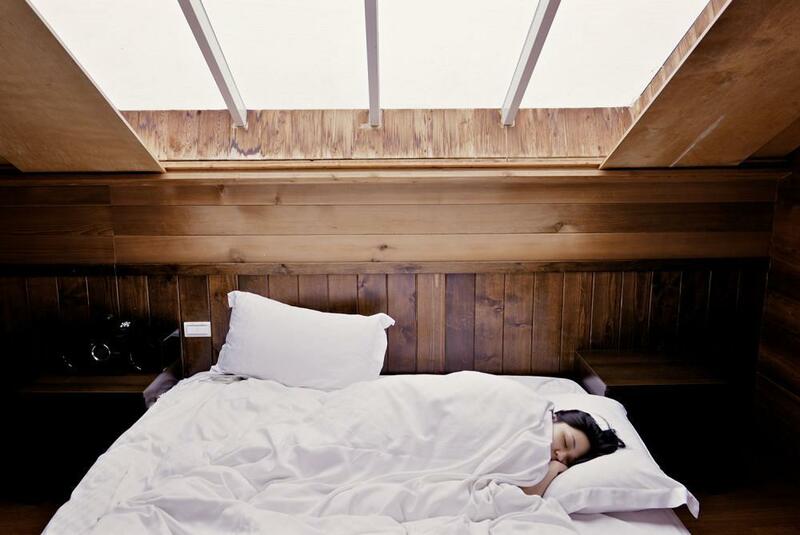 Most people sleep best in a room that is a few degrees cooler than during your waking hours. Go to bed tired. Ensuring that you get enough physical activity and mental stimulation during the day helps you feel tired when you hit the pillow at night. Find a stress outlet. If stress keeps you up at night, talk to a friend, loved one, or a professional during the daylight hours about your worries. You might find it helps to keep a pen and paper near your bed so you can write down whatever thoughts are preventing you from falling asleep. Once you feel more rested, you’ll have more energy to exercise and stay active throughout your day, as well as fewer hormones telling your brain to eat, eat, eat. The less compelled you feel to keep eating and the more you are able to exercise, the easier you weight loss journey will be.